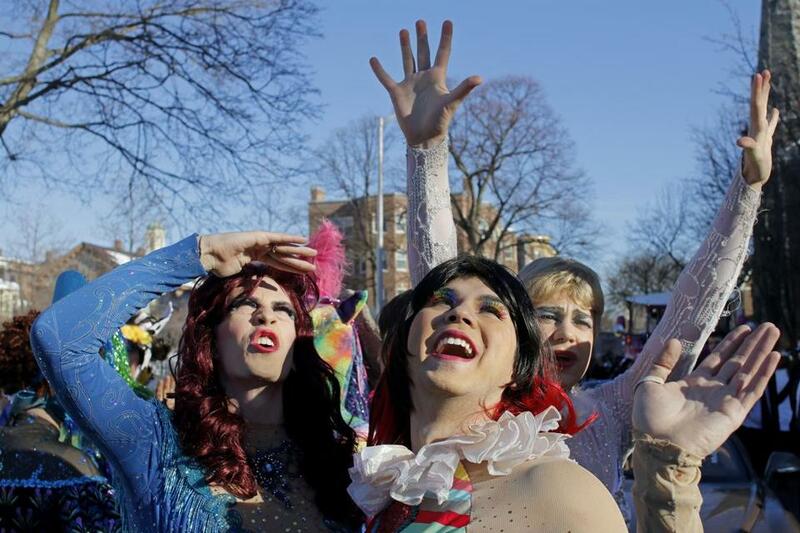 The scene at Harvard during the Hasty Pudding Woman of the Year awards in 2015. Amy Poehler was the winner. How does the sexist throwback that is the Hasty Pudding Theatricals still exist? And why on earth would actor Mila Kunis associate herself with it? Kunis, who took an impassioned stand against sexism in Hollywood long before this year’s Time’s Up movement was born, was named the Pudding’s Woman of the Year this week. She’ll be feted with a parade down Mass. Ave. on Jan. 25, and an award ceremony at Farkas Hall, before the club begins the annual run of its burlesque show. Now more than ever, that show seems like a relic. Back in 1795, when the Hasty Pudding Club was formed, Harvard was an exclusively male institution. It made sense then for its annual theatrical productions to be all-male affairs, with women’s roles played by men in drag. But then the 20th century arrived. And the 21st. Women entered Harvard. And to its credit, the Hasty Pudding Club eventually welcomed them into just about every aspect of club life — except the one for which it is best known: the annual show, where men play men, and men in drag play women, and any actual women who want to be in it are out of luck. Harvard’s Hasty Pudding Theatricals will honor the actress with its 2018 Woman of the Year Award on January 25. For three years, frustrated women performers at Harvard have auditioned for roles in Pudding shows in the hopes of breaking that tradition, to no avail. Of course, the school’s secretive, all-male final clubs give the lie to that image, which is why president Drew Faust and others at the college have been trying, so far with decidedly limited success, to force them to reform. The Pudding performances are islands of exclusion in a student organization that is otherwise pretty open-minded. They’re also opportunities women are being denied: The shows, funded by patrons with deep pockets, boast big budgets, professional directors, and connections with people working in the theater industry. They’re as close to a real Broadway production as college students can get, with 40-show runs and tours that take them to New York and Bermuda. But the shows don’t just exclude women: They truck in sexist stereotypes, too. Here, the drag is more like Jack Lemmon in “Some Like It Hot” than Bianca Del Rio in “Ru Paul’s Drag Race,” with male actors sporting giant bras and heels for laughs. The men in the productions are doing drag like their fathers and grandfathers might have. And it is mostly men of their fathers’ and grandfathers’ age who are keeping women out, say women who have tried to get into the productions: Alumni and benefactors are the ones resisting change here. Some have pushed back. In 2015, honoree Amy Poehler took a jab at the Theatricals during her award ceremony. And in 2016, 86 Pudding alumni signed a petition asking that women be allowed to join the cast. But the old guard has prevailed. How they can continue to do so, especially now, when women in Hollywood and their allies are on a crusade against sexism and harassment, is unfathomable. A spokesman for the Hasty Pudding Club did not respond to requests for an interview.